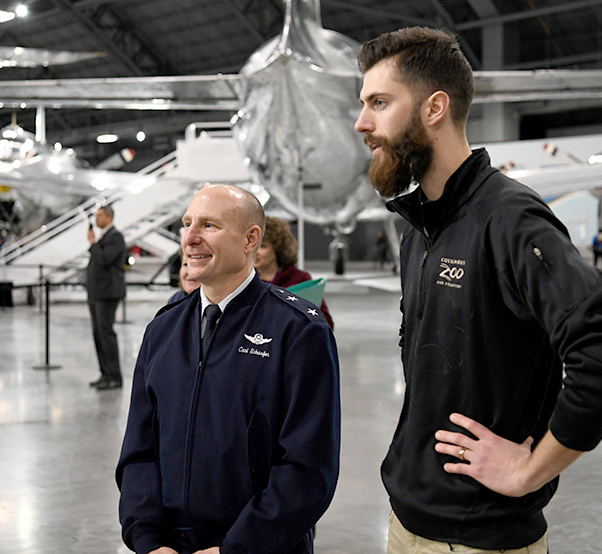 Maj. Gen. Carl Schaefer (left), Air Force Materiel Command deputy commander, observes activities with a volunteer from the Columbus Zoo during an Air Force Science, Technology, Engineering and Mathematics outreach day at the Air Force Museum, Jan. 6, 2019. The innovation mindset the Air Force needs to fly, fight, and win needs to be nurtured and developed in the next generation of Airmen to help carry the force into the future. We seem to be bombarded with Spark Tanks, innovation awards and organic innovation organizations. It leaves some wondering whether you need to climb onboard the innovation train or wait for the fad to pass. Some folks are just too busy to worry about innovation, thinking it’s “someone else’s” job. To launch the AFMC Year of Innovation campaign, I wanted to share some quick thoughts on innovation. First, our discussion is not actually about innovation, it’s about WINNING! Our nation is counting on AFMC, the Air Force and the Department of Defense to compete with and deter our adversaries, but if deterrence fails, we must win any conflict or war. Innovation is about staying one step ahead of our adversaries. It’s a culture where we embrace technology, remove inappropriate bureaucracy, take appropriate risk and change at the speed of relevance. Our job in AFMC is to innovate. We research, develop, test, field and sustain the most awesome air, space and cyber force in history. This includes developing and sustaining our critical nuclear enterprise, as well as our power projection platforms (our bases). AFMC has a huge responsibility – none of which happens without our people – our highly skilled workforce that shoulders this responsibility. In 1947, our Service was birthed so we could focus on the air domain. Through innovation, we built the world’s most powerful Air Force. It was built by innovative, risk-taking Airmen, like Chuck Yeager and Jimmy Doolittle, like Jackie Cochran who advocated for then led the Women’s Auxiliary Service Pilots. Airmen who were willing to experiment and fail during the course of discovery. Airmen willing to slash unnecessary bureaucracy for speed and agility. Innovation is not a word or a fad, it’s in the Air Force DNA! A quick internet search yields countless accounts of companies and business that failed by neglecting to explore new ideas and innovate. Many of these organizations were Fortune 500 companies during their heyday, having reached the top levels of success through innovative thinking and cutting edge technology. Think about companies like Blockbuster Video, Kodak, or even Pan American World Airways (Pan Am). When was the last time you rented a movie at a Blockbuster and paid a late fee because you forgot to return it on time? When was the last time you flew overseas on a Pan Am flight? By failing to integrate innovation in their organizational DNA, these companies failed to evolve to thrive and exist today. Our job is to ensure the Air Force changes fast enough to counter all current and future threats. This requires a culture of innovation. 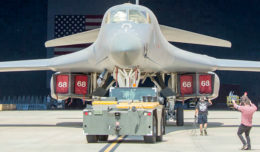 Innovation ranges from the scientist or engineer in the lab who is inventing the next-generation of Air Force weaponry to the grassroots efforts happening at every level, every day, in our organization when people see a better, faster way to do their job. We don’t need a complex plan to innovate, nor do we need to invent a new tool or piece of technology to be innovative. In fact, the most innovative activities in our command are simple and cost nothing, but make a world of difference to our mission success. Take for example, the Airmen at the dining facility on Edwards Air Force Base, Calif., who realized using reusable to-go containers would not only reduce costs, but provide a reduced impact on the environment. That’s innovation. Or, what about the financial management Airman at the Air Force Installation and Mission Support Center who used his Excel skills to develop a way to automate data pulled from the Defense Travel System that reduced hours upon hours of work to minutes. That’s innovation. And let’s not overlook the innovations that our skilled and talented civilian force bring to the mission, such as that of an Arnold Air Force Base, Tenn., machinist whose invention of the Trapper Lapper 5000 automated the arduous, hands-on lapping process, doubling the shop’s daily output of rotor sockets. A process that once required the hand-turning of a crank upwards of 900 times per piece was eased by a new machine that increased productivity and minimized human strain. That’s innovation. These are just a few of the countless ways our civilians and Airmen across AFMC are innovating each day. These simple acts are making small, but significant impacts on our missions and add up to big dividends for the command. From the very highest levels of the Air Force our leaders are looking to you to awaken that innovative Airman inside us all. So, the next time you hear the word innovation, I challenge you to take a moment to think to yourself, how can I do my Air Force job better, cheaper, or faster? When this mindset is part of your DNA, you’ll guarantee our nation will always be prepared to WIN!